Ever watch one OF those award shows on TV AND wish you could score SOME OF the awesome swag that the celebrities take home? 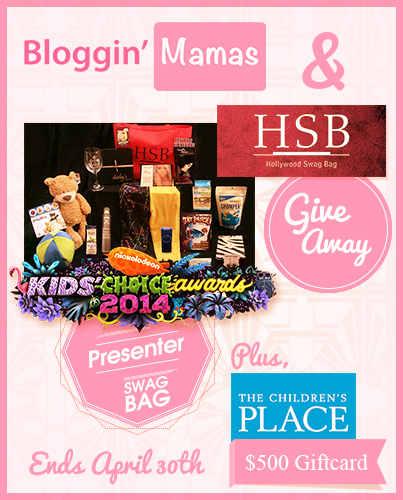 Finger Click Saver has teamed up with Bloggin’ Mamas & Hollywood Swag Bags to make that wish a reality. One lucky winner will receive a Swag Bag that was given out to Nickelodeon Kids’ Choice Awards 2014 Presenters and Nominees ($800 Value) + a $500 gift card sponsored by The Children’s Place. This give away begins 4/17/14 AT 12:01am EST AND ends 4/30/14 AT 11:59pm EST. It IS OPEN TO United States Residents 18 AND over. Winner will be selected via random.org AND notified via email within 48 hours after the drawing. Winner will have 48 hours TO respond OR a new winner will be selected. Winner’s name will be displayed via the Rafflecopter widget below. Buddy Ball The Buddy Ball is a multi functional toy that can go from a teddy bear into a ball in a matter of seconds. The soft plush also stores a variety of kid treasures inside. The company gifted the nominees with a variety of their bears named Max, Eva, Landry and Sam. OPPOS A line of girls leggings featuring interchangeable legs. Short for opposites, OPPOS™ enables girls to mix and match the legs of their leggings for a different look every day of the month (and beyond). Various pieces of AngieShel Design’s gorgeous handcrafted jewelry. Ericka La Presle-Freer, creator of Starbars is added her gourmet organic super food bar in a delicious mint chocolate chip flavor. The “Brain Bar” was included to help nominees get their “Think On”, particularly helpful during an acceptance speech. Darby’s English Toffee is the finest toffee maker in Southern California. They have added their classic box for the nominees. Author Jennifer Ormond gifted her precious book Baby’s Binky Box. Oxylent Multivitamin Supplement Drink Oxygenates, hydrates, circulates and rejuvenates. Drink Oxylent Breathe Life. SeaSnax, a favorite among celebrities, launched a new product “Chomperz” to all the recipients. Chomperz can be described similar to a chip, but with the low calories and nutrition of seaweed. SeaSnax are gluten free and all natural. Try Chomperz and you will be hooked. Crave Naturals included three items from their product line, featuring the best selling Glide Thru Detangling Brush, Whiplash Eyelash Curler & Mirage Argan Oil. Tat Patch takes your ripped, destroyed and distressed jeans to a new level. Tat Patches go on the inside, peeking out. Everyone received an assortment of cool designs. DidiPopMusic supplied nominees with a collection of her smart and soulful music for kids. Rusk Hair made sure the nominees’ hair was perfectly groomed with its entire line of products. Nominees over the age of 21 enjoyed Tipsy Girl Wine Design Custom bedazzled wine glasses for the sophisticated oenophile. Focal Instincts Photography is including a gift certificate for award winning photography. ***Finger Click Saver is not responsible for prize shipment.